This detailed review is for the product, Quantum Health Athlete’s Foot Cure. This anti-fungal formula contains an all-natural herbal remedy and is an ointment that adheres to the skin once it has been dried off. It aims to not only treat fungal infection but also protect your skin throughout the day. If you are interested in learning about this unique anti-fungal treatment, read our review below. While Quantum Health Athlete’s Foot Cure acts as a sort of mask that dries off and sticks to the skin, it is still used similarly to other creams and ointments. Before applying this treatment, it is advisable to first clean your feet or affected area completely with the use of warm water and soap. Dry it off with a clean cloth towel. You can then apply a thin layer of the cream over the infected areas and be sure to take into account the spaces between the toes as well. Let the treatment dry which should take about 2 minutes. You should wear comfortable and well ventilated socks and shoes and always try to keep you feet dry. Sweat can exacerbate fungal infections so be sure to change your socks, clean your feet and apply another layer of this treatment when necessary. Quantum Health Athlete’s Foot Cure is considered relatively safe and offers less chances of skin irritations than that of standard anti-fungal creams. However, there is always the chance of certain people reacting negatively to this formula and that might cause them to experience severe skin irritations once the cream has been applied. One tube of this product costs around $9.28. Each tube contains about 21 grams of the cream. It can be purchased from their official website as well as other well-known online stores. It is also available in select pharmacies and drugstores. The Quantum Health Athlete’s Foot Cure comes with a return policy which you can use if the product arrives damaged or if you simply do not find the results satisfactory. If you wish to return the product based on its ineffectiveness, you must contact their customer care service within 30 days of the purchase. They will then guide you through the proper steps to send back the product and get a full refund. 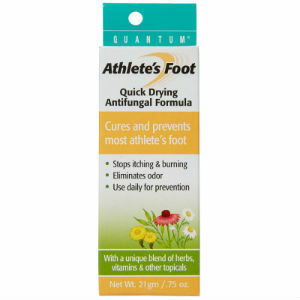 Overall, Quantum Health Athlete’s Foot Cure can be viewed as one of the safest anti-fungal treatments around. Its masking properties actually help keep the affected area safe from bacteria all day long. However, while it might be relatively effective it will cost individuals a lot more since a 21 gram tube will only last for a couple of weeks. The fact that it is used as a mask means you will need to apply a lot more than usual each day compared to other creams and ointments. Jimmy Rodriguez	reviewed Quantum Health Athlete’s Foot Cure	on November 19th	 and gave it a rating of 3.